Screenshot from surveillance footage in the Clint Carter case, which prompted Public Defender Laura Bixby's records request. They didn’t find any drugs. But they did find brass knuckles, according to the police report. The assault charge came later at the University Medical Center while, according to Bixby, Carter was shackled to a hospital bed. She said she only learned of the existence of the footage when it was sent to her through discovery along with the body camera footage. 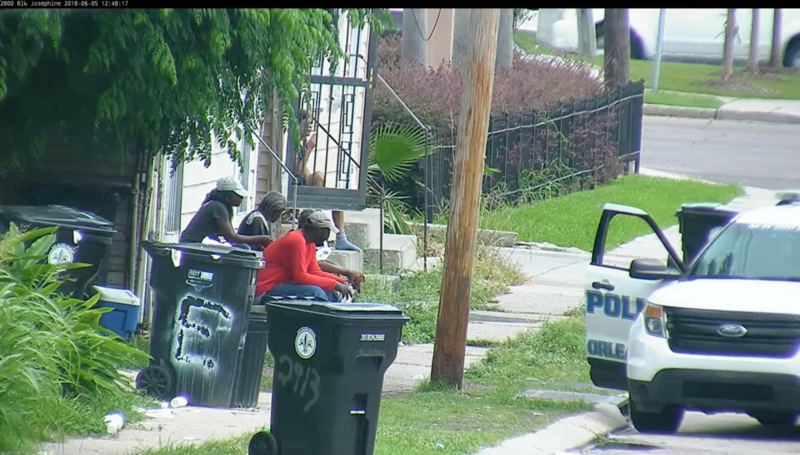 For Bixby, this raises concerns about how the NOPD is labeling their video surveillance operations in police reports. She also believes the surveillance and search and subsequent arrest may have violated the Fourth Amendment and infringed upon Carter’s reasonable expectation of privacy. She said that the surveillance system gives the police powers that far exceed the capacities of a human police officer: zooming in with sharp clarity, software that can search through thousands of videos for specific objects in minutes, and the ability to be in hundreds of places at once, vigilantly watching 24 hours a day. The camera that filmed Carter was roughly 500 feet away from the incident (a football field is 360 feet long). Carter was found not guilty on all three charges on Nov. 2, but the new arrest was a violation of his parole. He is now back in prison and slated to stay there for more than three years, until February 2022. In 2017, the office of the consent decree monitor audited NOPD stops, searches, and arrests and found possible consent decree violations in 20% of police body camera videos they viewed. “This remains an area of concern,” the report said. 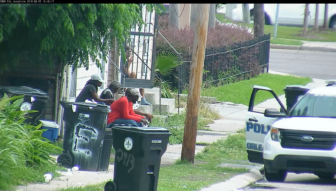 Even some proponents of neighborhood crime cameras are nervous about how the NOPD will utilize them. At the time of the arrest, Carter said he was trying to get to the hospital. He suffers from diabetic nerve pain, and said his feet and legs were swelling up. “I was waiting for a ride to get the hospital when they ran up on me,” he said. After officers pulled up and detained Carter, “no narcotics were recovered in the vicinity,” according to the police report. They ended up arresting Carter for trespassing “per request of the property owner.” But the address at which Carter was supposedly trespassing is across the street from where he was standing when he was arrested. In the video, he never approaches that house. And Bixby says that during the trial, the officers admitted that the property owner never made a complaint in the first place. The officers also searched the house of the property owner they said made the complaint, claiming there was an “aroma of marijuana emanating from within.” They didn’t find any narcotics there either. “We also do not publicly identify citizens that come forward and alert investigators to potential criminal activity,” Scheets said. After the arrest, Carter was taken to the hospital, where he was booked on another charge: simple assault. Officer Omar Rodriguez then “adjusted” the blanket so he could see Carter’s hands. But according to the report, officers had already searched the inside of Carter’s pants and found nothing. According to the police report, Carter “became irate,” chastising the officer and “swinging his right hand and pulling on his left hand.” But Bixby says that during the trial, Officer Rodriguez admitted that Carter had been shackled to the bed. The police report says that Rodriguez was standing “about five feet away from” Carter. Nonetheless, Carter was saddled with another charge. Although Carter was found not guilty on all three charges, he remains in prison. He was released from prison on parole in January, after serving time for cocaine possession. Getting arrested on a new charge was a violation of his parole, and he now faces another three years in prison. During the trial, Bixby submitted a motion to suppress the prosecution’s evidence, saying that the original search and arrest violated Carter’s rights. “Mr. Carter was detained, handcuffed, frisked, and searched as a direct result of invasive surveillance conducted by the New Orleans Police Department,” the motion says. The mounted police camera is located at least one and half football fields away from the incident. But given its capabilities, it might as well have been right across the street. Just under three minutes into the video, it closes in on Carter, showing him go into the alley, come out and speak to another man. Carter can then clearly be seen sticking his hands into his pants. “It’s an argument based on a line of US supreme court cases that says that technology that allows police officers to do something that they could have done before is ok on a limited scale, but not on an enormous, shocking, pervasive scale,” she said. There are currently 340 cameras wired into the Real-Time Crime Center. But the city is building a far more extensive network. 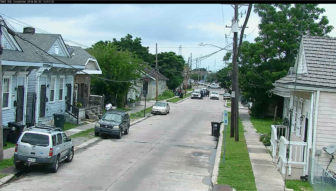 Mayor LaToya Cantrell’s administration has enthusiastically supported increased surveillance, with plans to add more city crime cameras through various avenues, including a state neighborhood development grant and even an anti-litter program. But the main source of new cameras will come from public-private partnerships. This week, Cantrell held a press conference to celebrate the first anniversary of the Crime Center and announce SafeCam Platinum, an effort to link thousands of privately owned cameras to the system. There are 6,000 cameras currently registered with the basic SafeCam program, which serves as a database of private cameras, but doesn’t stream directly to the city’s monitoring center. At the press conference, the director of the city’s office of Homeland Security and Emergency Preparedness said that many of these are capable of linking to the monitoring center. “The ‘canopy’ of cameras integrated into the Real-Time Crime Center is virtually unlimited as we utilize private sector cameras to supplement City-owned cameras,” says a presentation from the city’s office of Homeland Security and Emergency Preparedness, which oversees the crime camera monitoring center. When the police detained Carter, they provided two justifications in their report: “suspicion of narcotics sales and the fact that the subject was trespassing.” The video does not show Carter trespassing, and it is unclear who told the police that there was potential drug trafficking in the area. The undercover officer cited in the report was never identified or called to testify. Instead, the state presented the surveillance footage as evidence of the officers’ suspicion that a crime was taking place. “The surveillance did not reveal evidence of Mr. Carter actually committing any crime,” Bixby’s motion to suppress says. The judge never ruled on that motion because Carter was found not guilty before it was considered in court. In the video, whoever is operating the camera zooms in on passing pedestrians. At one point, the camera trails a woman until she walks into her home. The camera also adjusts to focus on someone walking out onto their porch. From the Avoyelles Parish prison, Carter said he is taking classes to try and reduce his sentence, including one called “Inside-Outside Dad.” Carter has three children, aged 22, 13 and 11.